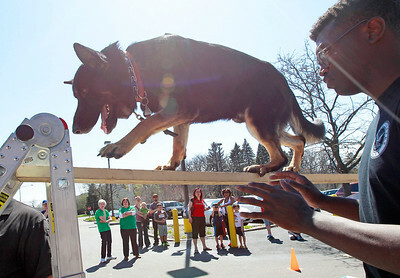 Candace H. Johnson Cydney Septs, of Great Lakes, with Disaster Dogs of Illinois, watches over Echo, a five-year-old German Shepherd, as he walks across a ladder demonstrating a ladder plank drill during the Pet Expo at the Round Lake Area Public Library. 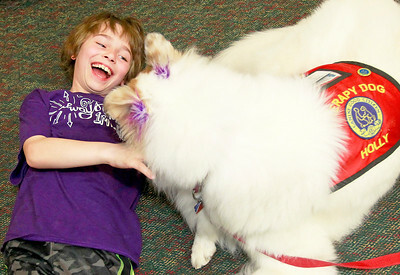 Candace H. Johnson Vince Tobin, 9, of Wauconda plays with Holly Collie, a therapy dog, on the floor during the Pet Expo at the Round Lake Area Public Library. Holly Collie is owned by Debbie Allen, head of youth services, at the library. 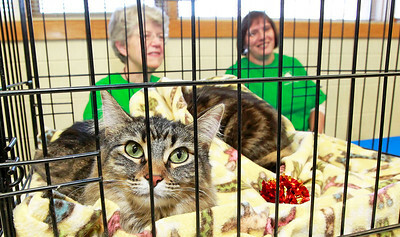 Candace H. Johnson Tabby cats Ellen and Portia, up for adoption, rest in a crate while Katie Simmer, of Mundelein and Angela Meder, of Lindenhurst, volunteers from Save-A-Pet, sit close by to watch over them during the Pet Expo at the Round Lake Area Public Library. 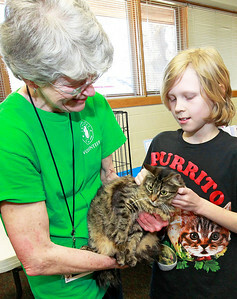 Candace H. Johnson Katie Simmer, of Mundelein, a volunteer with Save-A-Pet, lets Dylan Krater, 11, of Round Lake pet Ellen, a tabby cat up-for-adoption, during the Pet Expo at the Round Lake Area Public Library. Candace H. Johnson Robin Bengtson, of Lake Villa with Robin's Dog Star's plays with her dog Gracie, a one-year-old black Labrador, during the Pet Expo at the Round Lake Area Public Library. 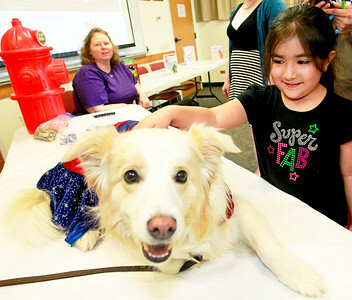 Candace H. Johnson Elianna Patino, 5, of Round Lake pets Cedar, a Border Collie, with Robin's Dog Stars during the Pet Expo at the Round Lake Area Public Library. 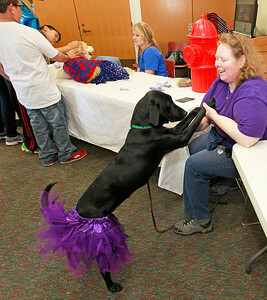 Robin Bengtson, of Lake Villa with Robin's Dog Star's plays with her dog Gracie, a one-year-old black Labrador, during the Pet Expo at the Round Lake Area Public Library.